So much yarn, so little time. : a mystery solved! 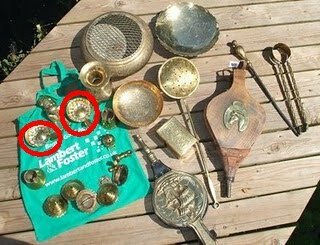 I blogged recently about an auction I'd been to - and yesterday had a reminder of another auction (which I've now realised was over two years ago) where I bought a box of brass bits and pieces. 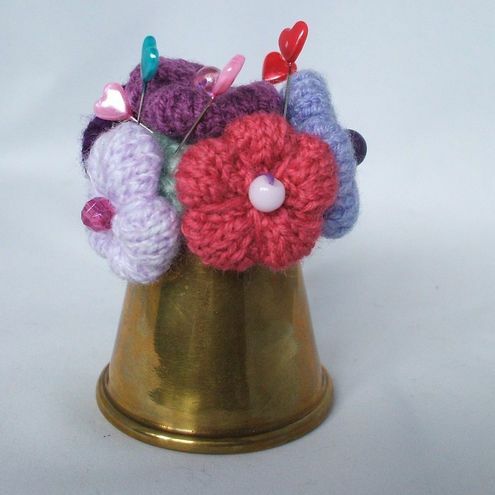 Some pieces I sold on ebay, some I use, and some I upcycled by knitting flowers to put in them - one of these even made it into Period Living, a national UK magazine! Inevitably though, there is still a box of leftover brass bits. Yesterday in the Town Hall I saw a display containing an item similar to the ones that I've circled, so I now know it's a tastevin. 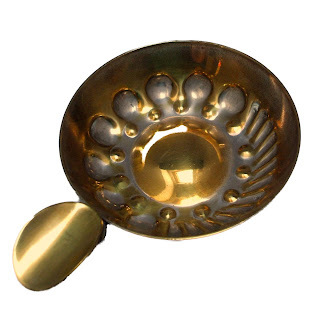 Wikipedia says this: "A tastevin is a small, very shallow silver cup or saucer traditionally used by winemakers and sommeliers to enable them to judge the clarity and color of wine that was stored in dim, candle-lit wine cellars. Tastevin are designed with a shiny faceted inner surface. 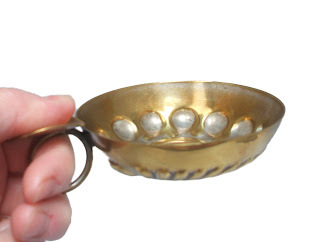 Often, the bottom of the cup is convex in shape. The facets, convex bottom, and the shiny inner surface catch as much available light as possible, reflecting it throughout the wine in the cup, making it possible to see through the wine." Sadly they're not rare or worth a fortune :-( but I'm glad I now know what it is! The bellows are big, fireside bellows - one pair we use, the other went on ebay. There's a chestnut roaster - we used that on the fire at Christmas - and a heavy Egyptian sphinx that has become a doorstop.